We’re familiar with this saying because our moms would always so graciously interject it whilst we gobbled down a sleeve of cookies and half a bag of chips. While it’s easy to shrug off, I challenge you to really ponder what this means. We’ve all pictured something similar to the below illustration, but think of this beyond just its idiomatic qualities. If you eat an apple, your body continues to break down that apple into itty bitty pieces until it has stuff it can utilize. Those tiny apple particles become a part of your body, used for any number of things. You are now one-bajillionth apple (that’s not an actual statistic – don’t quote me). If you follow up your apple with some Cheetos, you become one-bajillionth artificial flavoring (again, do not take my word as science. I’m just illustrating a point here). What goes into your body eventually becomes part of your body, as it is with all living creatures. Now if you picture the less-than stellar ingredient deck of Cheetos1, compare that even still to the ingredient deck of heat-extruded, commercial pet food. Not good. Our pets are slowly becoming equal parts corn, meat and bone meal, and artificial flavor packs. Given this, it’s no wonder we see so many issues with the gastrointestinal system. Whether it takes the form of horrible gas, soft stool, a gurgley gut, or vomiting, many of our pets deal with digestive issues. Nourishment affects the entire body, especially the GI system, which includes all the organs shown below. Scavenger Carnivores: meat-based eaters who generally consume dead or decaying animals and plants in their surrounding habitat. Scavengers do not typically hunt for live prey, but rather indulge in the remains of prey previously killed by a hunting carnivore. Obligate Carnivores: also meat-based eaters who thrive on the tissue of other animals. While they can safely consume small amounts of fruit, veggies, and grains, their main source of nutrition must come from a meat-based source if they are to survive. A raw diet is the closest digestive choice to a dog’s or cat’s natural carnivorous diet. It contains the vital enzymes the digestive system needs to function properly. Moisture is essential in the diet of a carnivore. Typically, a carnivore would receive most of its water from the moisture in the tissue of its prey. Carnivores, by definition, are meat eaters and as such, should receive the majority of their protein from meat-based sources. Unfortunately, these three dietary expectations aren’t always easy, convenient, or economical to meet in our fast-paced lives. And we definitely hear that. But if we’re 100% honest with ourselves, feeding our pets food with an ingredient deck that looks like the one below is not entirely responsible pet ownership. It keeps pets from starving, and that’s at least something. But that’s about all this type of food does for our pets. Essentially, all those vitamins and minerals you see in that ingredient deck are what had to be added back into the food to get it to meet the regulatory standards. And all of it had to be added back because either there weren’t any to begin with or because the few nutrients that did naturally exist in the product were broken down due to the high-temperature extrusion process. (Plus, the only animal that would thrive on this diet–who’s top ingredient is ground yellow corn–is a CORNivore). Microflora Plus is a great option for keeping your dog’s digestive system regular. Even the healthiest of dogs can benefit from a solid probiotic, as Microflora offers nutritional benefits for pups in all seasons of life. From room-clearing toots to the occasional bout of diarrhea, our digestive supplement can help provide relief for the GI tract (…and for your nose in the case of the gassy pooch!). Probiotics are live microorganisms that project a health benefit on the host. More specifically, they are bacteria that are beneficial for the digestive system. They’re quantified by colony forming units (CFUs), a term that describes the viability of the probiotic based on its ability to reproduce and form a colony. For reference, a reasonable probiotic supplement for a 50lb dog should have at least 10 billion CFUs per dose. A prebiotic is a long-chain sugar that feeds bacteria. It’s role in a digestive supplement is to encourage the growth of beneficial bacteria (i.e. – probiotics) in the digestive tract. The most common type of prebiotic is the long-chain sugars or fibers called (ready for this?) fructooligosaccharides, or FOS. These prebiotics avoid digestion in the first part of the GI tract, making their way completely intact to the colon. The colon is the area where beneficial bacteria live and produce gut-derived vitamins, digest fibers, eliminate waste, and absorb fluids from the food previously ingested. “Good bacteria” (probiotics) compete with “bad bacteria” (like salmonella, for example) to eat the prebiotics. This is why its important to only administer prebiotics alongside probiotics to ensure the right bacteria will eat them. This is also why its important to have a probiotic with a high number of CFUs, so that it can easily beat out the bad bacteria in eating the prebiotics. 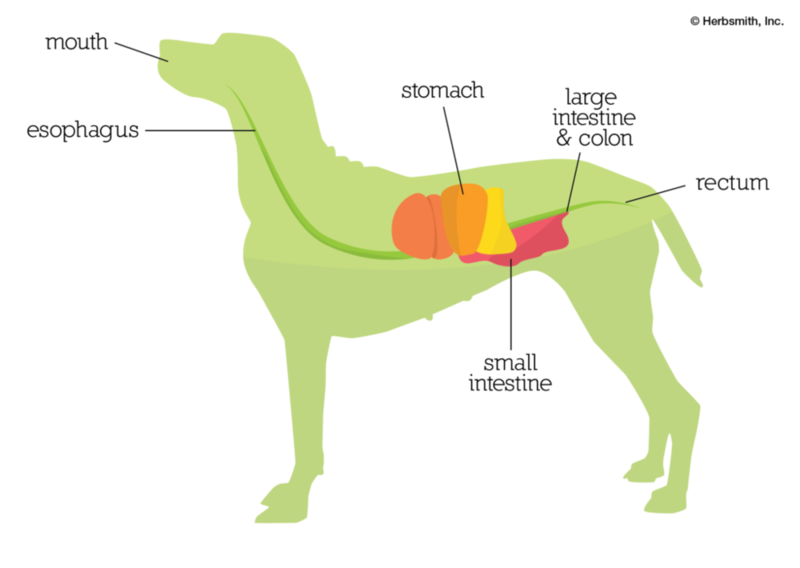 The role of digestive enzymes is to break down the nutrients your pet eats. Large molecules like proteins, fats, starches, and cellulose need to be broken down into smaller, usable substances in order to be utilized effectively by the GI tract – Digestive enzymes do just that! Different types of enzymes specialize in different types of nutrients. For example, protease, bromelain, and papain break down proteins into their smaller units, amino acids. Amylase breaks down starches into absorbable sugars. Lipase breaks down fats into fatty acids. By adding a supplemental source of digestive enzymes, you can help your pet fully utilize the food it takes in. If a carnivore is receiving plant-based proteins as its primary protein source (i.e. – if a dog’s diet consists of food with ingredients similar to the above), he may not have enough amylase or cellulase to fully utilize the nutrition. For this dog, a digestive supplement that includes digestive enzymes is especially important. And of course, our herbal recommendations. Digestion-supportive herbs are a natural way to soothe your pet’s tummy from gastrointestinal upset. They help probiotics and enzymes in supporting digestive function without getting in the way. Ginger is great for soothing already-existing gastrointestinal issues. Cinnamon helps to warm and stimulate the digestive system, keeping it from becoming stagnant. Licorice can help increase the flow of bile, which is important for the elimination of toxins and waste. With these fantastic four in the mix, the digestive supplement can help support and maintain the proper function of the digestive system. To purchase Microflora Plus click this link. Get “Prevention is Key” free holistic pet tips when you signup!